The field is prepared; the tile is in the ground; the irrigation is ready; and the newly arrived vines are soaking in water and waiting to be planted. When you receive your vines, check to make sure they are in dormant and in good condition: no broken graft unions and no green tissue visible from the buds. Keep the vines in a cool, dark place - maybe under a tarp in a walk-in cold room or root cellar - and do not allow the vines to dry. The day of planting, vine roots can be soaked in water for a few hours prior to planting to ensure they do not dry out during planting. Be sure not to damage roots or graft unions while you handle the vines, and while broken or damaged roots can be removed, we do not recommend root pruning prior to planting. The vines are going to need as much of the roots as possible to spread in the trough or hole dug for them. Again, keep vines as moist as possible (e.g., bring the tub of water containing vines to the field and refill the planter from there, or cover them with a tarp on a trailer). Nurseries ship vines with the intention that they be planted nearly immediately, so be sure to know when vines will arrive and when you will be able to plant them. Reduce the gap between vine arrival and vine planting as much as possible. While we do not generally recommend root pruning, it is best to ensure that vine roots will fit in the hole or trench provided for vines. With this in mind, aim to plant the largest, most-intact root system possible, which means that holes dug with shovels or trenches made with tree planters need to accommodate the plants brought in from the nursery. Vine roots should be evenly distributed and not skewed in one direction upon planting. Consequently, an auger up to 18 inches in diameter and adjustment of the tree planter may be necessary. The gist of planting anything is that roots go in the soil, and the rest goes above ground. 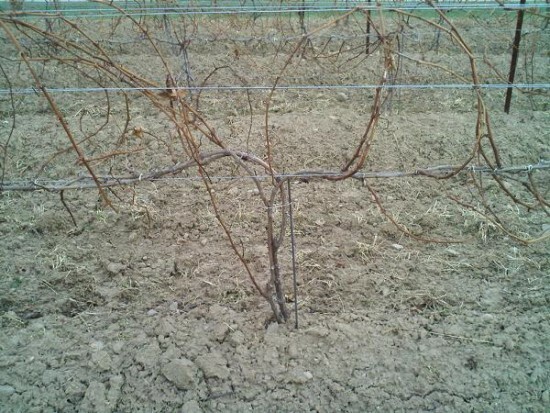 When grafted vines are being planted, care must be taken to keep the graft union above the soil line, but not so far up that hilling up becomes impossible. (If planting early in the spring, before the last threat of frost, hilling up loosely to the graft union may be necessary.) Vines will need to be straightened after using a tree planter, or even an auger, so someone will likely need to be assigned the task of straightening vines and tamping down loose soil around the base of the vines. These topics will be covered in the nutrient management and weed management sections, respectively, but it is worth a mention here that these are important immediate, post-planting steps. Without adequate fertilization and weed control, vines will struggle to thrive. 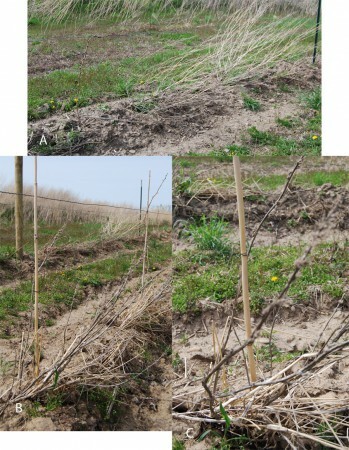 In fact, lack of weed control has destroyed the planting efforts of many a viticulturalist in just the first year (Figure 1). Figure 1. Vitis vinifera vineyard with poor weed control leading to >50% vine mortality due to lack of weed management. Weeds can quickly out-compete vines, killing or stunting vine growth. The first year is good time to get at least the beginnings of a trellis system to keep vines off the ground and make weed management easier. Posts and one wire at about 30 inches can be a good starting point, especially for what will become vertical shoot positioned (VSP) vines (Figures 2 and 3). If the plan is to train to a high wire cordon system, putting the posts in during the first year will help when the wire goes up the following year. For these vines, bamboo stakes are often adequate for the first season of growth, and these can be tied to wires in either circumstance, depending on the vigor and growth of the vines. All too often, growers discover their site to be more productive than thought, leading to vines that reach the top wire in the first growing season. In these cases, it is best to get a trellis system in place in the first year. Figure 2. Pinot Noir vines allowed to grow along the ground during the first season make for difficult training and pruning in subsequent years. Figure 3. Close-up of vine in Figure 2. Allowing and selecting canes that require bending up toward the catch wires can make canopy management difficult. 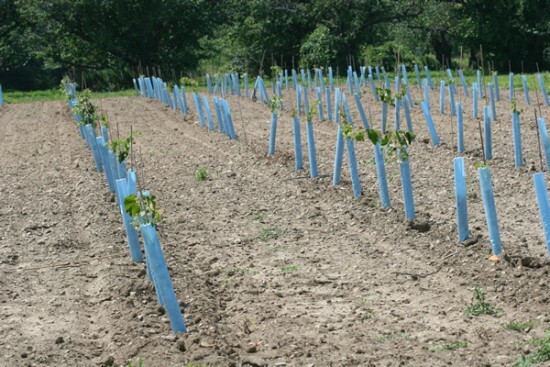 There are two main camps when it comes to the use of grow tubes in new plantings: One insists they are necessary because they increase vine growth in the first season, and the other insists they decrease winter hardiness of the wood while increasing disease and insect pressure on the vines. A third option, of course, is to leave grow tubes on vines for about halfway through the season to allow them time to harden off before winter, but also to allow the vineyard manager to spray for weeds during most of the season. Most recommendations fall into the third category to enable weed management without damaging young vines, but also allows for some time for the vines to acclimate to the season. There are caveats to this option, though. One issue is that one must pay close attention to what goes on inside the tubes - Japanese Beetles love to hide and eat grape leave in grow tubes. A second problem is that sunburn can occur in regions or season with intense sun exposure. Third, deer also like to eat tender wine grape leaves, and grow tubes do not necessarily protect vines from deer browsing. 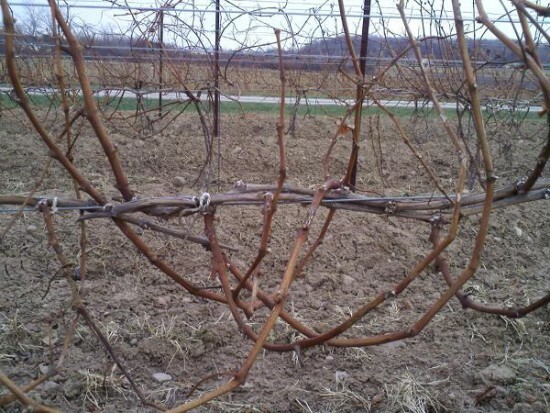 Monitor vines for damage, or establish a deer repellent program before browsing can begin. Dami, I., Bordelon, B., Ferree, D.C., Brown, M., Ellis, M.A., Williams, R.N., and Doohan, D. 2005. Midwest Grape Production Guide. Bulletin 919, Ohio State University Extension; Columbus, Ohio.